One of the former Merck Family houses was still being used as a home. 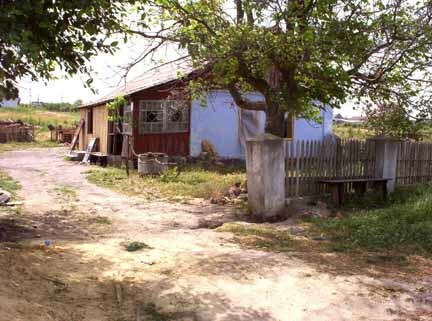 It was now occupied by a Ukrainian family. It appears that this building is one of the original village buildings which has survived for 200 years. The colony is located in a valley through the steppes, that of the Baraboi River, which has its origin 9 verst [ca. 6 miles] in a northerly direction from the settlement. The river runs through the village and thus divides it in half. The colony is located 50 verst [ca. 33miles] from the district center, the city of Odessa. The soil consists mostly of black dirt, with a content of nitric acid and, with favorable weather, is quite fertile. There are many stone queries located ½ verst [ca. .3 mile] from the colony, and the stones are of good quality. In 1848 the community land consisted of 3561 dessy. (now there is more land), and it is divided in the following manner: Cropland takes up 1725 dessy., meadows take up 800 dessy., grazing land uses 894 dessy., field gardens and home gardens take up 110 dessy. There are 110 trees. The name “Elsaß” was given to the colony because most of the residents came from the province of Elsaß. The colony of Elsaß was established by 60 families numbering 138 males and 135 females. Of these families, 36 families, 83 males and 88 females, came from Elsaß. From the Duchy of Baden (District of Rastatt and Bruchsal) came 21 families with 49 males and 42 females. From Prussia/Poland came 2 families with 5 males and 4 females. From Austria there was one family of two individuals. It is not known who led these settlers to Elsaß. The land for the colony was made available through Colonial Inspector von Rosenkampf and the through Mayor Brittner and was owned previously by the landowner Tscherbanka, purchased from him by the Crown. The area where the colony now stands contained two houses in a bad state of repair, covered by reeds. Until August, 1911, the colonists received a daily allowance of 3 kopeks silver from the Crown. Additionally, each family received 101 rubles, rbl., 42 and 6/7 kopeks toward purchase of equipment and supplies for their operation. Funds brought by the Colonists totaled 10,020 rbl. silver. The events and misfortunes in Elsaß were similar to those in neighboring colonies. At the present time the colony has properties and 1952 residents. There is a parish church, a pastor, and two schools with three teachers and 254 students. The colony of Elsaß owns 3667 dessy. of community land, which is divided as follows: Property yards take up 66 ½ dessy., livestock operations use 390 (?) dessy., vegetable gardens take up 36 dessy., orchards use 2 ½ dessy., vineyards take up 15 dessy., a forest consists of 15 dessy., 5 dessj. are under water, and a rock query consists of 10 dessy. 13 1/4 dessy. are used for roads, the railroad uses 13 1/10 dessy., cropland covers 2361 dessy., 220 dessj. is used for haying, and livestock grazing uses up 530 dessy. 220 dessy. is set aside as orphan land, which is rented out for a fee of 10 rbl. per dessy. Also, a significant amount of land is rented by the colonists from neighboring estates and landowners, for between 7 ½ to 9 rbl. per dessy. For hay land, the rental price ranges from 10-16 rbl. per dessy. The rock quarries are very productive. Up to 50, 000 cut rocks are sold annually.